The 21st GACC-RISDA International Inter-Varsity Chess Championship ended today in the University of Malaya, Kuala Lumpur. In this edition, 104 chess players competed for the Championship, including a Grandmaster, an International Master, two Women International Masters, 7 FIDE Masters/Women FIDE Masters and a Candidate Master. The tournament was held in 9 rounds Swiss format from 19th to 24th January. As a result of the competition, IM Das Sayantan became the Champion scoring 8.5 points. 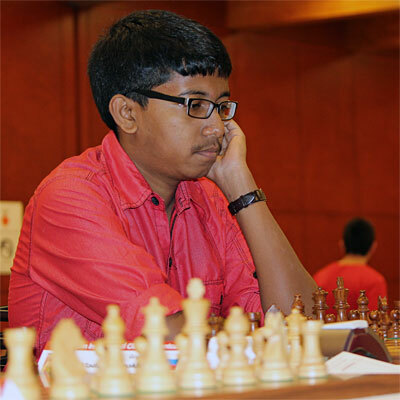 GM Ghosh Diptayan came the second, also 8.5 points (Das Sayantan wins tie-break), while Sumit Kumar came the third. All the top three winners are from India. Wan Mohd Azmie of Malaysia is the best local player in the competition. He finished in 7th place with 6.5 points. On the 19th January, Datuk Zahidi launched the 21st GACC-RISDA International Inter-Varsity Chess Championship.